Late Model built to ABS and MARAD re- quirements. Flush Deck Area 6,000 Sq. Ft.
Fresh Water Tanks 0 Gal. Bunker "C" Fuel Tanks 12,000 Gal. Manufacturer American Hoist & Derrick Co.
Boom (Certified rating with 140 length, 160' available) 20 part rigging 2.200 ft., WC - 6 x 36 I PS. 4 part standing standing bail 2-186 ft., 1WC- 6x36 I.P S.
From LASH Ships. Late Model. Manufactured by PACEO. 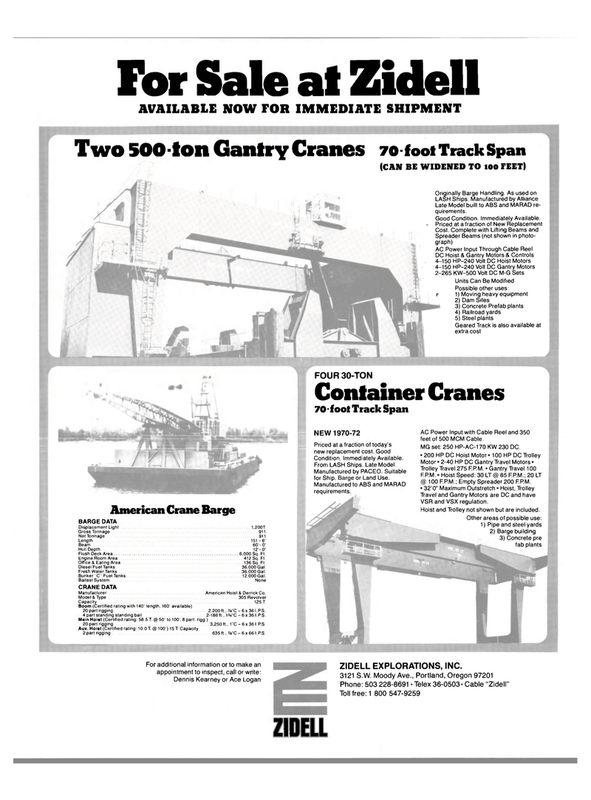 Suitable for Ship, Barge or Land Use. Manufactured to ABS and MARAD requirements. AC Power Input with Cable Reel and 350 feet of 500 MCM Cable. Hoist and Trolley not shown but are included. Phone: 503 228-8691 • Telex 36-0503- Cable "Zidell"